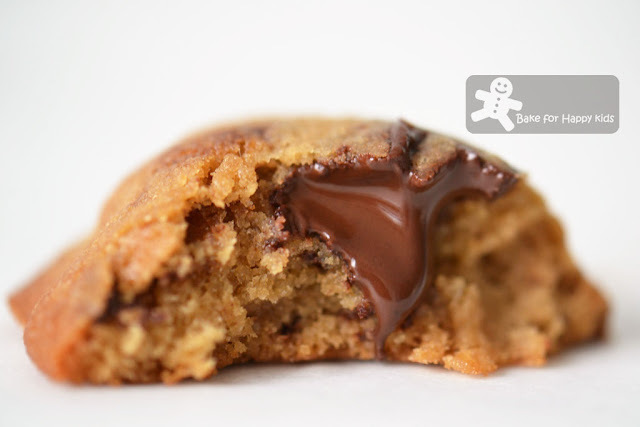 These "Perfect Chocolate Chip Cookies" are truly as perfect as Cook's Illustrated claims. 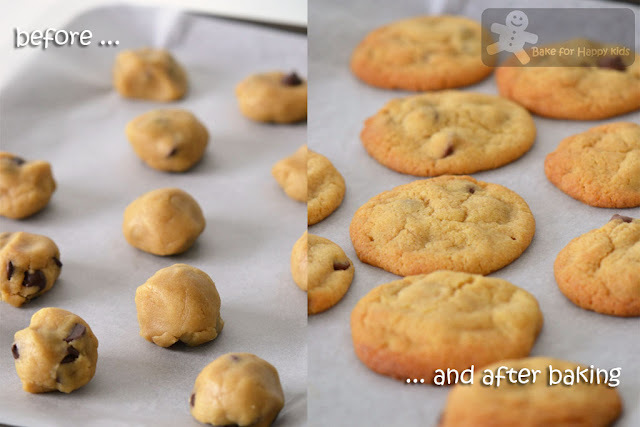 To re-invent this classic, Cook's Illustrated lists down all the details and possible improvements that they can make to achieve this perfect chocolate chip cookie recipe using a super-easy melt-and-mix method. These "perfect" cookies have a great balance in both sweetness and texture; they are moist and chewy on their inside and crispy at the edges. Although these cookies can be as perfect as they can be, I reckon that the texture and taste can vary too depending on the ingredients used in this recipe. I have baked these cookies more than once and whenever these cookies are freshly baked from the oven, they are all gone very quickly. Even after the cookies are gone, the smell would stay in my kitchen and all I can hear is "mmm...mummy...These cookies are delicious..."
For this post, I'm baking two batches of cookies. The first batch is the nice and simple NUT FREE ones for my son's little friends at crèche. The second batch is the gourmet ones with dark muscovado sugar, walnuts, vanilla beans and chocolate chunks for my family. Knowing that my son loves baking for his friends, I had involved him with stirring, baking and decorating these cookies and he was extremely happy and helpful doing that. Ta-da! My boy was very happy baking these cookies. One of my gourmet-style cookies. Are you drooling seeing this? Most recipes from Cook's Illustrated has to be subscribed via their website but this one is free and can be accessed via the Cook's Illustrated apps. The batch made with light brown sugar, vanilla extract and without nuts are for my son's friends at crèche as the all food cooked or baked for crèche has to be strictly NUT-FREE. The other batch with dark muscovado sugar, vanilla beans and walnuts are made with EXTRA LOVE (from me) for my family's consumption. Adjust oven rack to middle position and heat oven to 375°F . Line 2 large (18 x 12-inch) baking sheets with parchment paper. Whisk flour and baking soda together in medium bowl; set aside. Heat 10 tbsp butter in 10-inch skillet over medium-high heat until melted, about 2 mins. Continue cooking, swirling pan constantly until butter is dark golden brown and has nutty aroma, 1 to 3 mins. Remove skillet from heat and, using heatproof spatula, transfer browned butter to large heatproof bowl. Stir remaining 4 tbsp butter into hot butter until completely melted. Divide dough into 16 portions, each about 3 tbsp. Arrange 2 inches apart on prepared baking sheets, 8 dough balls per sheet. Bake cookies 1 tray at a time until cookies are golden brown and still puffy, and edges have begun to set but centers are still soft, 10 to 14 min, rotating baking sheet halfway through baking. 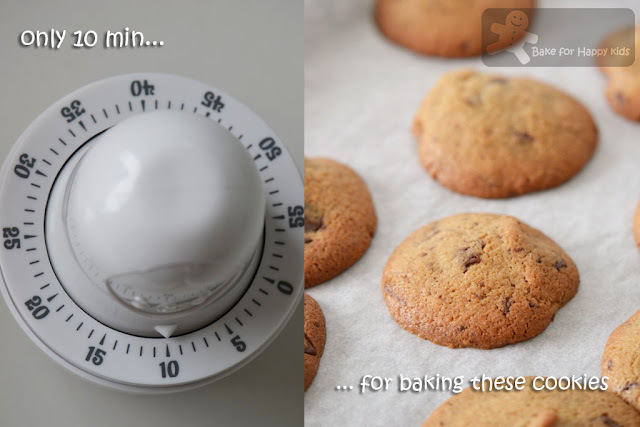 Transfer baking sheet to wire rack; cool cookies completely before serving. Note: Using the full amount of recipe, I've baked 22 nut-free medium sized cookies and 30 gourmet-style cookies in total at 180°C fan forced for 10-12 min. Half of the recipe was baked as the nut-free crèche batch and the other half was for our consumption. Before serving, my son and I gave each of the crèche cookies a smiley face. I can't say wich are my favorite chocolate chips cookies... although the last one I made were quite perfect to me... I tend to like mine on the chewy side... brown butter... it as to contain brown butter! Anyway... really like your gourmet version! 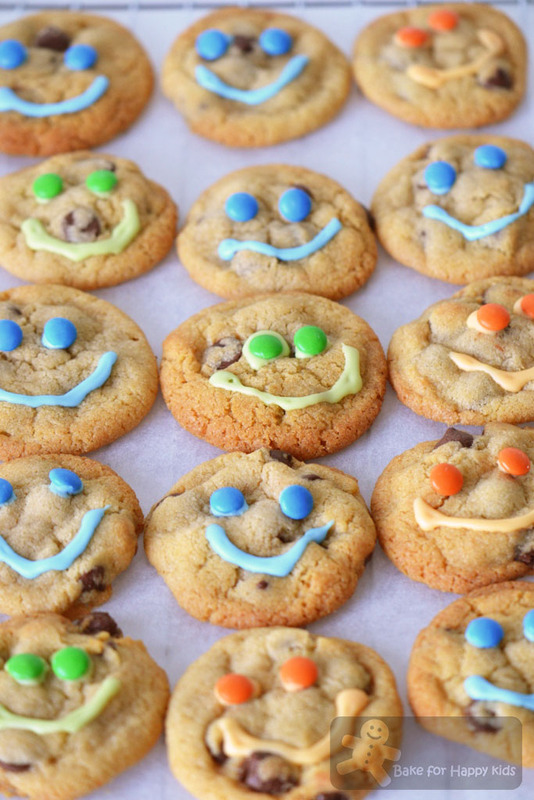 Love all those cookie smiles! Hi Zoe, your dough photo says rest dough in 4degC, when does this take place? After the whisking? Sorry that I have not included this modification step in my attached recipe. After all the ingredients were incorporated in the cookie dough, I prefer to rest the cookie dough about 1-2 hr in the fridge. This will firm up the dough and will be easier for me to roll them into balls. Oh Zoe, your son is so sweet & treating his friend so nice! What a gentleman he is! It's good to see him to enjoy baking with you & the cookies look very delicious there! My son loves to crack eggs these days. Made some cake yesterday & he kept checking on my digital scale & helped me to crack egg but some of the eggs landed on the kitchen bench! Irresistible cookies! Yummy! Planning to make some too, school holiday has started over here, and more busy cooking and baking! LOL! Hi Zoe, I'm not a cookie person but your last photo might just change that... Looks so yummy! BTW, Thanks for your email reply. Love that chocolate oozing from the centre! love the oozing chocolate pic, Zoe! Am always on the look out for a good choc chip cookie recipe so I'll try this one out. OMG, those M&M cookies are sooooo cute! I love cookies with chocs oozing out. I'm already drooling, Zoe! Wow,Zoe..your cookies look so temptingly yummy. I would be like your kids too going all 'mmm..mm...m.m..'. These are wonderful cookies and combined with chocolate they are simply irresistible! This looks awesome! i love the close up picture with the dripping chocolate. Yum! The nut free one for your son's friend is so sweet! Zoe! I love these cookies. 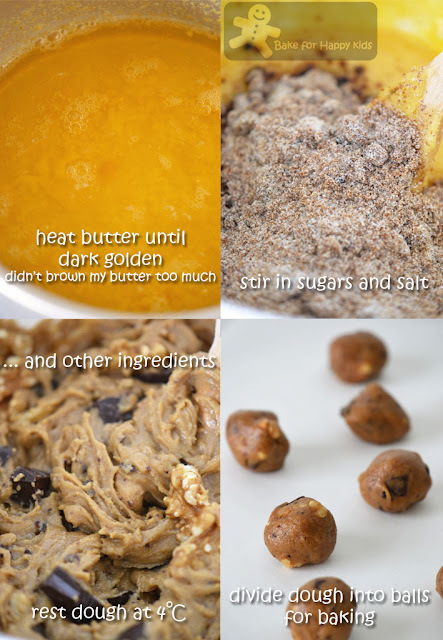 This truly is the best cookie recipe out there. 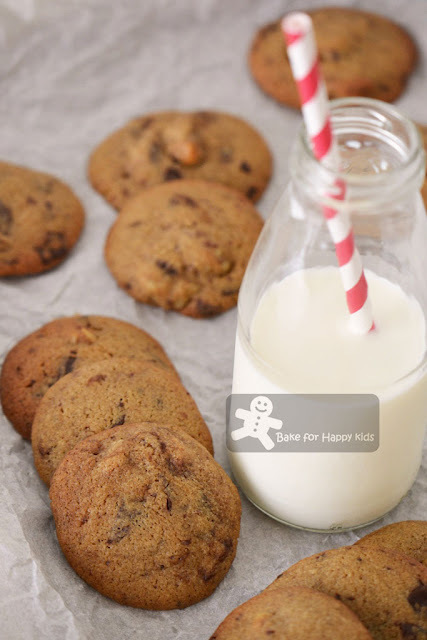 I only have one chocolate chip cookie recipe on my blog and this is it. Cooks illustrated definitely got it right. I use dark brown sugar as well. I sometimes use regular dark brown sugar or the muscovado kind. Both ways, the cookies taste great. I don't add nuts as my kids are not fans of nuts in their sweets. I also use bittersweet chips in the cookies. I do have a scar on my arm from the one time that I browned the butter to long. I was testing to see how long I could truly brown butter and it popped and burst and got me on the forearm. Luckily, the scar is healing and is only slightly visible. Can't wait to see what Martha recipes you make! These cookies are deliciously good ! Perfect cookies indeed ! I just love the the smiley cookies :D Another enjoyable mom and son baking session then ?! Zoe, I think my daughter will jump on me if I make these for her. Looks so pretty and attractive! My Sam(swcond son) is drooling over your chocolate chips cookies. The smell of chocolate chip cookies is almost as good as the cookies themselves! Look at that melty chocolate. Yum Zoe! Yes, I'm drooling, who wouldnt'? Yes, they certainly look perfect to me! your photos are SO lovely!! Mmmmm...I've made this recipe before, but you've created even more magnificent cookies with your tweaks!!! Your son's friends must have loved these :) I'd hold out for one of your gourmet versions! Oh I love chewy choc chip cookies! You can get quite picky on the cookies after tasting the perfect one! I'm sure the kids at kindy would love those smiley face one! Love these cookies! They are always a hit in our house! 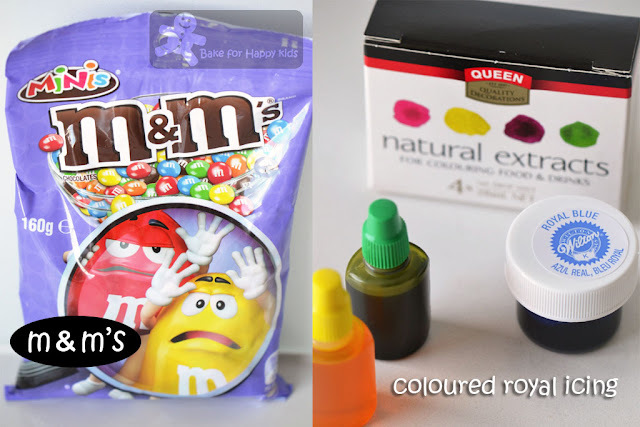 Love the idea of adding M&M's and smiley faces - adorable!! These cookies look just devine!!! And we absolutely adore the classic, red striped milk straw! Thanks again for following us - we're your newest follower! Hi, can i know what does unbleached all-purpose flour means? According to this website at Taste.com, http://www.taste.com.au/how+to/articles/928/flour, unbleached flour is free of the chemicals used to extend the shelf-life and whiten wheat flour. All-purpose flour is plain wheat flour with usually about 10% protein content and it is good for all general uses including baking of most cakes and biscuits. Hi Zoe, thank you so much for your explanation! I managed to find a pack of unbleached flour. This flour can be use for cake/muffin baking as well? I have done few times choc chip cookies baking but none of the choc chips melted like what i see from your photos here. Wondering if there is any secret recipe for this? Thanks! Depending on the brands and the cocoa content of the chocolate chips or the chunks that you used, the cookies taste slightly different. Most chocolate chips stay well in its shape after baking and probably NOT as flow-y as what you see in my photo. The chocolate that I used for the particular cookie that you like is dark chocolate chunk with 70% cocoa. Hi Zoe , would you be able convert your recipe into metrics? Coze it's pretty difficult measure via cups arms there are Aussie cups, us cups and UK cups thks!! !